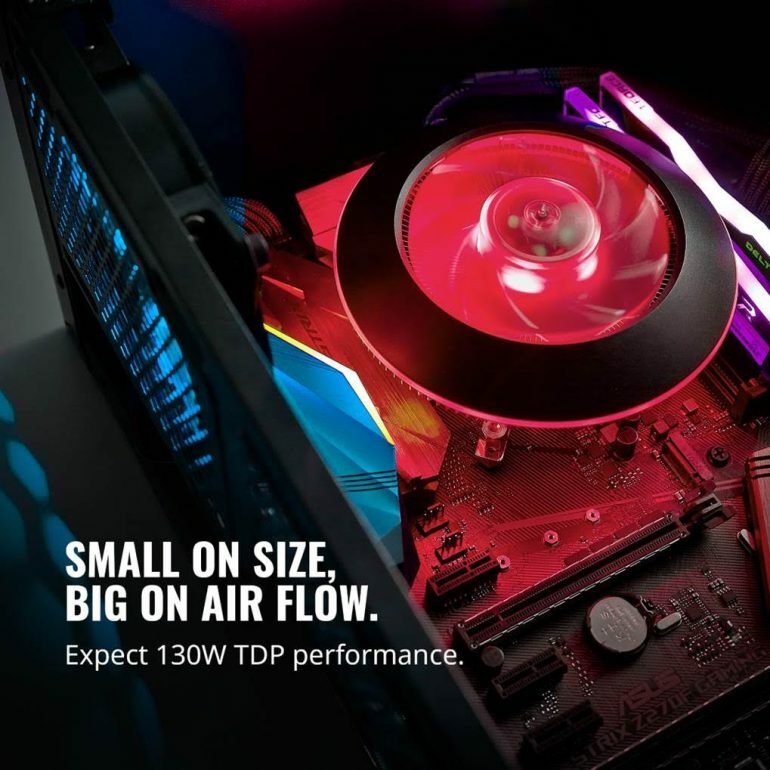 SINGAPORE – Cooler Master, a leader in PC cooling, case, power supply and peripheral, introduces a break-through design in heat transfer with the Heat Column; which increases heat transfer capacity by up to 7 times of traditional heatpipes. This enables the low-profile MasterAir G100M to perform on par with traditional heatsink designs. The Heat Column’s unified design seamlessly combines the contact with the CPU with thermal conductivity and phase transition. The entire block of Heat Column (Ø41.2) is able to transfer a massive amount of heat away from the CPU in the shortest distance possible. This break-through design enables low profile design to reach TDP of 130W that matches performance of traditional heatsink coolers. The MasterAir G100M uses a RGB 92mm PWM fan (600~2400 RPM) with an additional circular ring illumination to create an immersive RGB style and experience. This is fully certified by ASUS, MSI, Gigabyte and ASRock RGB motherboards, allowing you to customize the lighting through the motherboard’s software. Alternatively, a wired RGB controller is included inside the package if your motherboard is not RGB supported. The low profile MasterAir G100M stands at 74.5mm, a great fit for slim and tight PC cases, including mini-ITX cases. Even at these small dimensions, the heatsink has cooling capacity of 130W TDP. The MasterAir G100M is now launched in Singapore, priced at SGD 65.